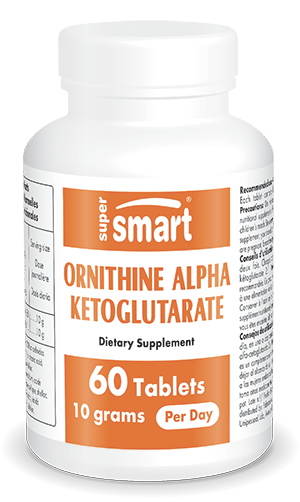 Ornithine alpha ketoglutarate (OKG) is a compound that combines two molecules of the amino acid ornithine with one molecule of alpha ketoglutaric acid, an important component in the Krebs cycle. As a precursor of growth hormone, ornithine is twice as effective as arginine. OKG supplementation increases production of GH (growth hormone) and of IGF-1, an active, easy-to-measure derivative of GH. OKG has been used to promote growth in children of abnormally small stature (Monkorzel, Goulet et al., Growth retardation in children receiving long term total parenteral nutrition: effects of ornithin alpha ketoglutarate, Am J Clin Nutr, 60(3): 408-13.1974 Sep). OKG increases protein synthesis and protects against muscular catabolism and is therefore particularly beneficial to sports enthusiasts and anyone wishing to promote their production of growth hormone. Other studies show that OKG is particularly active in the mechanisms of ammonia detoxification: it combines with the ammonia produced during muscular exercise and thus improves recovery, helping to prevent cramps and stiffness. OKG is also an effective inhibitor of protein glycation (the process in which sugar molecules bond to proteins by cross-linking': these non-functional structures accelerate the ageing process). Other ingredients: calcium carbonate, stearic acid, microcrystalline cellulose, magnesium stearate, silicon dioxide. Each tablet contains 1 000 mg L-ornithine alpha-ketoglutarate 2:1. Take from 3 to 10 tablets per day, in one or two doses according to your therapist advise.